Something just isn’t right there. And while the sleeping in is one thing, it’s how they’re spending their out of bed time that is the real kicker—YouTube, Snapchat, Insta; movies and TV shows; mindlessly mashing the buttons of poor, undeserving video game controllers. Your kids are certainly living their best summer—or so they think. Little do they know, or care to ponder, the impact of the phenomenon called summer brain drain. 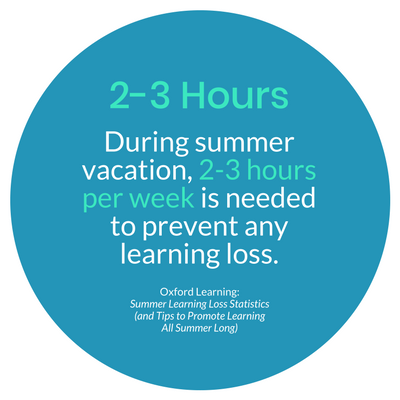 Or summer learning loss. Or the summer slide. Whatever term you want to use to describe the negative consequences that stem from kids being out of school for prolonged periods. While the break from early mornings and homework is nice for kids - and parents alike - it comes at a price. For the cost of those sleepy mornings and lazy days, your son or daughter receives close to nothing of academic value in return, and actually loses a ton in the way of academic skill and know-how. 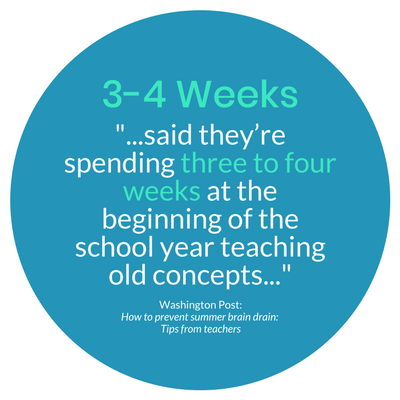 Not only do students forget important concepts, but summer slide also means that teachers have to spend the first few weeks of a new school year re-teaching the previous year’s ideas and principles—to rusty brains, at that. And while certain students are more likely to suffer from the dreaded drain than others, all kids are susceptible to the phenomenon, unfortunately. So, what can you do? Year-round schooling hasn’t really caught on most places, and it's easy to see why. Kids need breaks just as much as adults need vacation. Like most problem solutions, it comes back to balance. Ask a smoker who tries to quit cold turkey, or a pizza lover forced to diet on arugula only. Such extremes don’t usually end well. Thus, when you go pedal to the metal with school, school, school, study, study, study, and then switch things up to no school or studying whatsoever, there are going to be negative consequences. 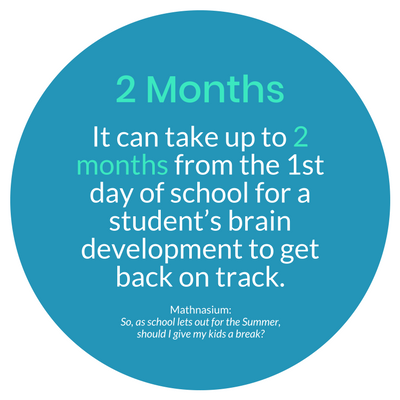 Luckily, summer learning is a thing, and something many kids and teens engage in between June and August. And even better, it doesn’t have to come in the form of summer school. Here are the details on how kids and teens can potentially avoid brain drain (and come out even stronger on the other side). Think back to when you were sneaking veggies into your kids’ meals to maximize nutrition while going to lengths to disguise their greens as a different food entirely. The same idea goes for summer learning. The point is, ask yourself what it is your kids like to do; what are they interested in? Perhaps it is the aforementioned social media or video games, or maybe it’s their smartphone and the many apps that come along with it. Believe it or not, there is a camp for all of those things, and then some. For instance, an academic or tech camp offers courses rooted in coding and video game development, robotics, and design. And while a "summer course" might sound like school on the surface, it's really the furthest thing from it. Camps like iD Tech provide high-energy environments free of textbooks and teachers and full of hands-on learning and like-minded peers. We are talking Minecraft modding or designing Fortnite-inspired levels; 3D printing, and more. Really, things kids already enjoy except now, they are learning the skills necessary to go from tech consumer to tech creator—again, all without even really realizing they are doing so. Through fun summer learning, young minds stay stimulated, helping kids maintain a fresh learning mindset, and even better, result in them absorbing additional, valuable skills they might not have a chance to learn elsewhere. Not to mention their newfound inspiration to keep researching and reading, learning, and doing, even while out of school. They are basically reversing the learning loss by turning brain drain into brain gain, and advancing their education at the same time. One way to do so is to start building a new skill foundation, apart from the core subjects they are already learning in school. By shifting the focus from memorization to areas like problem-solving, creativity, and if-then thinking, kids and teens are encouraged to engage with complex problems and come up with logical solutions. STEM skill-building, for instance, challenges students to think differently, and through a hands-on manner versus what they're accustomed to doing when reading and memorizing from a textbook. When a student is tasked with learning how to code in Python or how to use Autodesk software to build a 3D model, they are unlocking areas of their minds that haven't really been tested before. The beauty of it is, no matter the specific area in which they are engaging, such STEM learning can make kids and teens stronger in all subject areas, from English to math to art, and nearly everything in between. And by doing such learning at camp, they are also collaborating with peers and pushing themselves to new limits, and again, stimulating brains that might otherwise sit dormant—or close to it depending on the complexity of the TV show or cat video they're watching. “You won’t know if you like it unless you try” are the words many parents utter right before they are forced to start thinking of those aforementioned inventive ways of disguising vegetables. While these words are often used to coax a picky eater into trying a new food, the same is true when it comes to finding a passion or hobby. For technology in particular, most K-12 schools still don’t adequately teach computer science and other related tech fields. So, asking your child to give STEM learning a shot might be met with resistance, because it’s new. Something “new” can be something “fun” if it aligns with existing interests. Last, bringing us back to the summer slide, studies show that developing hobbies and interests (like coding or game design) can actually improve a child’s cognitive skills, concentration, and determination, and even develop their personality. I like a good viral video as much as the next person, but for most of us, when do we find ourselves reaching for our phones? Or plopping in front of the TV? It’s usually when we have nothing better to do, right? Again, summers provide kids with a much-needed break from their increasingly busy lives. It’s necessary, and not going anywhere. But while the first week or so of summer for kids and teens is met with a genuine enthusiasm to just absolutely chill and do whatever it is they want to do, most of the rest of the summer is just them participating in whatever is convenient; whatever is in front of them—TV, video games, phone, computer, etc. What I’m saying is, even the most involved kids and teens face summer boredom after a few weeks without structured activities in place. One of the things we hear most from parents is that after a day of camp, their child was begging to come back each day. Yes, I think our programs are that good, but a benefit of summer camp is the fact that it is providing a break from summer break! They have something to do! And wouldn’t you know it, that something is actually fun. Even when we teach more “serious-on-the-surface” topics like artificial intelligence or cybersecurity, we always do so with the idea that this is summer after all—it’s the only way to ensure campers are consistently engaged and remain excited about learning. Not to mention the incorporation of outdoor and non-course-based activities so that students can stay physically active as well. During summer vacation, two to three hours per week are needed to prevent summer learning loss. Eliminate boredom, and eliminate the need to resort to “mindless” activity, freeing up time to engage in active learning. I want to end by saying screen time is not the enemy—it’d be pretty difficult to be the #1 tech camp without it. But, it’s investing in the right kind of screen time that is the challenge. As a parent, aim to balance technology and life, but also, embrace the screen—embrace video games, embrace smartphones. They are tools as much as they are entertainment devices. The trick is to change the mindset. While most kids just sit and play games, get them thinking about other things while they’re playing—How was that character designed? Wow, how do they move so realistically? How are they responding to me pushing a single button? That’s the first step. Encourage kids to go from playing to questioning. Then from there, have them go from questioning to answering those questions - AKA learning - and then even “doing” by starting to create their very own games. It all starts with screen time; it must start with screen time. But to help stave the summer slide, that screen time needs to shift from playing, to learning, to doing. Minds stay sharp, kids are excited to actually learn during the summer, and then they roll back into school reinvigorated and in a better position to pick up where they left off. With these tips, summer slide stops here. Kids and teens can still very much enjoy their summer, while laying a foundation to help them succeed throughout the rest of the year, too.